Today we’re proud to announce the release of Mattermark for iOS. Our goal is to make it easier for millions of professionals and startup enthusiasts everywhere to get information about companies they are interested in. Yesterday, meaningful company information was scattered all across the web. Today, our app is the fastest way to get facts on companies and funding events while you’re out and about. Use Mattermark to prep for your next meeting or to keep track of new opportunities you hear about while on the go. Say hi to Ben. Ben works in sales at a large Tech company. He was in an Uber on his way to a startup conference a few weeks ago. Seconds away from his destination, he realized he knew only a handful of companies that would be there. He pulled his phone out of his pocket and opened the Mattermark app. Seconds later, he knew the fastest growing companies at the event and made real connections with all of them. Today, they are Ben’s favorite customers. Sara rocks. She’s been crushing it as a Full Stack developer for a year now, and is ready for a new challenge. She agreed to grab coffee with a friend 3 weeks ago. Her friend is employee #2 at a 5 person startup. Sara had never heard of the company so she opened the Mattermark app to check. They recently raised a Seed round from great investors and are getting serious media coverage! Sara starts her new job this week. Jeremy is a commercial real estate broker who constantly meets clients out of the office. In between giving office space tours, He walked into a sandwich shop for a quick lunch. While he was waiting on line he reached for his phone and opened the Mattermark app. A startup he worked with in the past just raised a huge round! He shared the good news on Twitter right from the app. Jeremy will be handing them the keys to their new office in a few days. With Mattermark for iOS, finding information about companies you are interested in is just easy. 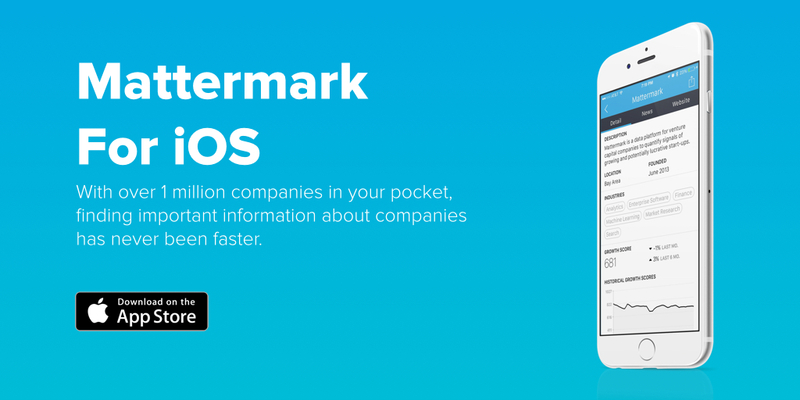 Get Mattermark for iOS for free.